Wow we thought Tuesday was quiet but Wednesday proves to be even quieter in the travel rewards world! Last week on our newly revamped U.K. site (FrequentFlyerBonuses.co.uk) we broke the news that Membership Rewards in the U.K. will begin limiting mileage transfers with three airline partners: Cathay Pacific, Etihad and Emirates. 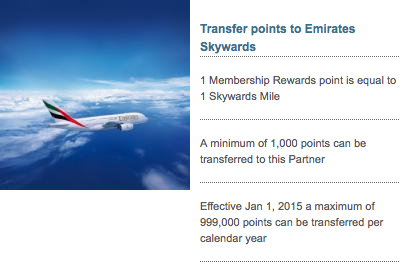 I reached out to Amex Canada to see if anything like this will transpire here and luckily there are no planned limitations on partner transfers other than those that Delta SkyMiles announced on October 1st whereby they will only allow a maximum a 250,000 miles to be transferred into a SkyMiles account yearly as of January 1st, 2015. In the bonus offer section you'll see the return of Avianca LifeMiles 100% bonus on buying miles. Even with their recent devaluations the purchase of these miles can turn out to be very lucrative for saving money on business class and first class travel on Star Alliance airlines.